‘Fairtrade’ not ‘Fairly Traded’ – Andy Wansbury’s fight to keep Tea Farmers independent. Andy Wansbury of St Thomas More in the Blexley Deanery is an ardent supporter of the Fairtrade ethos. He kindly shared with us his persistent challenge of the management of Sainsbury’s Crayford which is the largest branch in the country – over it’s use of the brand ‘Fairly Traded’ instead of the original ‘Fairtrade’. Read and see how Andy takes action and builds on the ongoing campaign “Don’t Ditch Fairtrade”. 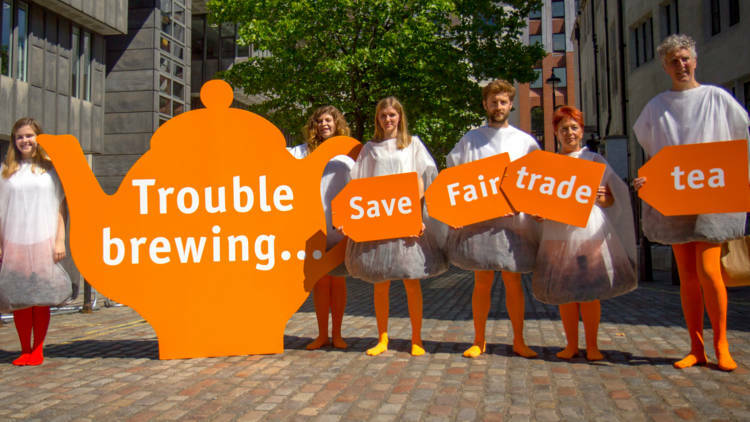 “When I first heard about Sainsbury’s replacing “Fairtrade” tea with “Fairly Traded” tea I was concerned because I normally shopped at Sainsbury’s. I thought for a long time about how best to respond and then it occurred to me to use the Sainsbury’s feedback website “Tell Sainsbury’s”. I spoke first to CAFOD, who advised me it would be better to write to the store manager, as this brings the issue to the attention to more of Sainsbury’s staff and not just those in the customer service department. Before writing I checked out “Fairly Traded” tea in my local branch of Sainsbury’s, which is Crayford, the biggest branch in the country. There was no Fairtrade tea on sale that day but there was plenty of Red Label “Fairly Traded” tea on sale. Before leaving the store I asked for the store manager’s email address and explained why I wanted it. To make sure I had all the relevant facts I researched “Fairly Traded” v Fairtrade on the internet; there were lots of useful information from the many supporters of the Fairtrade movement. I found several suggested pro-forma letters (including CAFOD’s letter). Inspired by them I composed my own letter in which I explained why I opposed Sainsbury’s dropping of the Fairtrade mark in favour “Fairly Traded”. I detailed many of the concerns that are being raised about “Fairly Traded” v Fairtrade and asked Sainsbury’s to reverse their decision to drop Fairtrade. I emailed the letter to the Crayford Store manager and placed a copy on the “Tell Sainsbury’s” feedback website. I received a very bland initial reply from Sainsbury’s customer services department: it ignored almost all of the issues I raised. I responded to Sainsbury’s asking them to clarify their answers and respond to items they had ignored. I received a further reply expanding on a few points but still ignoring others. I again challenge Sainsbury’s asking them to clarify some points and to answer the points that they had ignored. Sainsbury’s replied saying they had given me an answer and would not give me a further answer. I replied politely expressing my disappointment at their inability / refusal to answer all of the points I made. The points which Sainsbury’s will not respond to include the fact that the use of the “Fairly Traded” term is confusing and is misleading customers in to thinking that “Fairly Traded” is the same as or is part of Fairtrade. They will not respond to the points made in the open letter from the Tea Farmers, this includes issues like farmers do not want Sainsbury’s to drop Fairtrade in favour of “Fairly Traded”, the farmers have a 50% share in the ownership of Fairtrade, and it is the farmers themselves who decide how to spend the premium that is paid on Fairtrade products. In contrast, in Sainsbury’s “Fairly Traded” scheme the farmers have no ownership in any part of the scheme; they have to apply for money for projects to Sainsbury’s, who will then decide if the farmers can have money to spend on projects. When I wrote to Sainsbury’s I made the point that the Fairtrade system empowers the farmers because they are trusted to make their decisions on how best spend the Fairtrade premium where as the “Fairly Traded” scheme disempowered the farmers because they are required to submit their plans for projects for scrutiny before they can access the “Fairly Traded” premium. Sainsbury’s reply shocked me “There are differing views on what empowerment means”. Based on my understanding – if you take away a person’s ability to decide for themselves you disempower and disenfranchise them. I am about to contact Trading Standards because term “Fairly Traded” is so close to Fairtrade that it confusing customers and misleading them into thinking that “Fairly Traded” tea is the same thing as or part of Fairtrade. I wait to see how Trading Standards will respond. In the Swahili language, ‘Kujichagulia’ means self-determination. Andy Wansbury is one of many who are fighting for the rights of Tea Farmers to remain self-determining. He strongly questions Sainsbury’s appropriation of the ‘Fairly Traded’ brand which is easily confused with the original ‘Fairtrade’ identifying mark of the indigenous Tea Farmers worldwide. Andy is spurred to action and he’ll interrogate the appropriateness of the use of the Fairly Traded label. If you have been inspired and motivated by Andy’s determination to make right this injustice find out more now and take part in the day of action on 28 October. This entry was posted in Campaigning, Upcoming CAFOD event and tagged 28 October, Andy Wansbury, Campaign, Crayford, Fairly Traded, fairtrade, Kujichagulia, Sainsbury's, self determination, St Thomas More, Swahili, Tea Farmers, Tell Sainsbury's by cafodsouthwark. Bookmark the permalink.